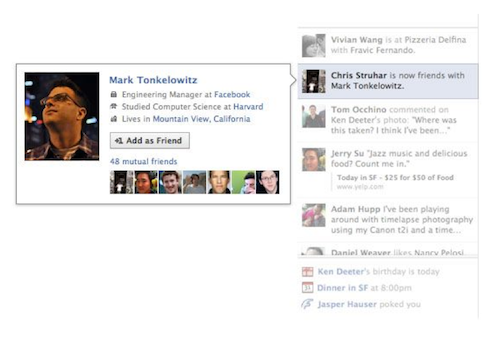 Facebook's most interesting new feature in awhile, the news ticker, will show you what your friends are doing in real time [ h/t Robert Scoble ]. Facebook's news feed wasn't designed for real time: you don't see every update from every friend, and even when friends post updates while you are both logged on, it may take several minutes before you see the post. The new ticker sits on top of your chat window on the right-hand side of the screen and runs the length of the window. When you click on an item, a small window pops out to give you more details or the opportunity to comment directly on the action. But the news feed isn't dead -- Facebook has revamped it so that the most popular photos and status since your last log on are marked with a blue corner. The top news and recent news are in the same location so you can see both the feed and the ticker at the same time. Photos are now larger, too. Facebook is expected to announce a flurry of features and products this week, including its anticipated music platform, at the f8 Developer Conference in San Francisco on Thursday.